Black and white wedding photograph of a beautiful bride sitting on chair gracefully holding out her lace-trimmed veil moments before her destination wedding at the Lodge at Cordillera in Vail, Colorado which is perched on a mountaintop overlooking the magnificent Vail Valley and Sawatch range. 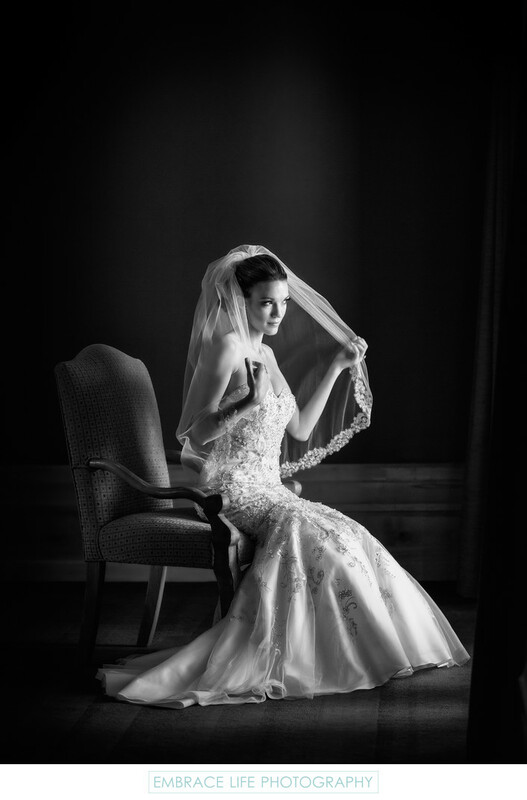 This soft, elegant portrait highlights the intricate embroidery of the bride's gown. This wedding photograph received an Honor of Excellence Award at the 2015 WPPI 16x20 Print Competition.